On October 3, 2008 the US Congress passed The Emergency Economic Stabilization Act (TARP), otherwise known as the banking bailout package. The bill also included $150 billion in renewable energy subsidies that trade associations and industry lobbyists had labored over for years. The subsidies were, for the most part, in the form of tax credits on the capital invested, that is, an Investment Tax Credit (ITC) based on the cost of the system. For the first time in at least two decades, small wind turbines were included in the technologies that qualified for the ITC. The ITC will be available for eight years. Complicating matters for small wind turbines, the amount of the ITC is limited by the kW rating of the turbine. Up to a point, a higher rating, qualifies for greater subsidies. Turbines with lower ratings, or what Congress logically thought were smaller wind turbines, receive fewer subsidies. That's understandable, but Congress, consumers, and even many small wind turbine advocates often don't understand how wind turbines turn the wind into electricity. The commercial wind industry also won a long-sought extension of its Production Tax Credit (PTC). Unlike the ITC, the PTC is not based on the cost of the installation but on the amount of electricity actually generated. This form of subsidy is the wind industry's preferred method because it avoids the abuses that tarnished the industry in the 1970s and the early 1980s. Congress extended the PTC for commercial-scale turbines only one year. With the stroke of a pen, Congress began a process that reinforces the natural tendency of small wind turbine manufacturers to inflate the capacity of their products without any substantive improvement. The unintended result: even more confusion among consumers and another blemish for the small wind turbine industry that is already struggling with its credibility. I've written about the Skystream before (see my Commentary on the Skystream 3.7) where I both lauded SWP for it's revised rating system, and criticized them for the actual design of the turbine. Here's what I had to say about SWP and their revised nomenclature for the Skystream "3.7". "SWP has learned some lessons. It's designating the wind turbine as the "3.7" for its rotor diameter in meters rather than the flawed and misleading power at rated wind speed that has been used in the past. This is a bold step for an American company and they should be complimented on the move. SWP has also rated the wind turbine at a relatively low wind speed of 9 m/s or 20 mph. Most of its competitors rate their wind turbines at much higher speeds. The rated power at a specific wind speed has very little to do with how much energy the wind turbine will deliver to the load. Much of the time small wind turbines operate at well below their rated speed. By lowering the rated speed, SWP has effectively lowered the kW rating of the wind turbine. This gives consumers a more realistic idea of what they can expect in comparison to past practices. " SWP deserved the plaudits and I was happy to give it. That was then, though. Congress had acted and I needed an interpretation of what it meant. SWP was prompt and helpful and confirmed my calculation of how much subsidy a typical Skystream would qualify for. However, I had a nagging suspicion that Congress had unintentionally penalized SWP because the Skystream used a lower, or what I call a more responsible, kW rating than their competitors. Other products of the same size as SWP's 3.7-meter diameter wind turbine could use a higher or possibly even an unrealistic rated power capacity and qualify for more subsidies than the Skystream. While SWP wouldn't answer that question directly, they surprised me by immediately noting that they were in the process of "rerating" the turbine, clear confirmation that the rating race was again on in the small turbine industry. And in fact SWP did "rerate" their turbine. On November 14, 2008, I viewed Southwest Windpower's Skystream page. where the Skystream was now "rated" at 2.4 kW rather than it's original 1.8 kW. Now, does that mean the Skystream is 30% bigger or more powerful than it was before? No, not at all. It is no bigger and will capture no more energy than before. Well then, what does it mean? Nothing really. SWP has made no change or improvement to the turbine. It means that SWP simply changed a number that appears on its brochures. This will allow the Skystream to qualify for more subsidies than before-and nothing more. Is this an abuse of the tax code? Possibly. That's for the Internal Revenue Service (IRS) and state attorney's generals to determine. However, before we rail against SWP or call the IRS to investigate, bear in mind that all the other manufacturers of small turbines had already built into their product literature inflated rated capacities. SWP was just reverting to the industry's unacceptable standard practice of inflating the rating of their wind turbines. What then is the practical consequence of SWP taking this action? More consumer confusion. Even before Congress' action, the manufacturer itself was confused about the "rating" of their own product. 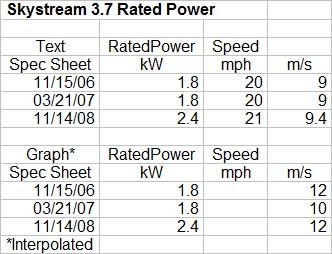 SWP has posted at least three different spec sheets on the Skystream, each with a different rating. While the text in SWP's product literature remained consistent from one to the next, the graphics accompanying the text has varied considerably. In early spec sheets, Skystream was rated 1.8 kW at 12 m/s. Then in a later spec sheet it was rated 1.8 kW at 10 m/s, a substantial improvement or at least a different artist. Then in the most recent incarnation the Skystream is rated 2.4 kW at 12 m/s. If professionals are left scratching their head and asking, "Which is it? ", imagine the confusion among consumers. The answer is that it doesn't matter, except in the advertising wars. SWP's estimate of Annual Energy Output (AEO) has remained-to their credit-consistent from one spec sheet to another. In the end it's the AEO that really matters to a wind turbine buyer-that is, how much electricity you can get out of the turbine. Unfortunately, consumers and many government public policy analysts are easily misled. Consumers often only read the "power" curve or the "rated power", and not the charts of electricity generation. For confirmation, just look at the fiasco with small wind turbine subsidies offered by the Massachusetts' Technology Collaborative. Congress' resort to an easy to understand subsidy system as opposed to a more sophisticated approach based on actual generation has led directly to more confusion in the small wind turbine market. And while I haven't posted any articles specifically on capital, up-front, or buy-down subsidies (all terms for the same idea), I have argued against such policies in my presentations on wind energy and renewable policy mechanisms for more than two decades. In my presentations to workshops in North America and elsewhere I've argued that there is no worse way to promote the development of renewable energy, whether wind or solar, than capital subsidies. Unlike newcomers to renewables, I've had the unfortunate experience to live through the abuses of the tax code that capital subsidies encouraged in the 1970s and 1980s and I've seen the same results repeated in other countries around the globe. For example, in 1984 I trespassed on private property and climbed up the tower of a "wind turbine" to see if in fact it was a wind turbine. (I suspected that it was not.) The "turbine" was made to look like a wind turbine, but in fact it was not. There was no generator or gearbox in the nacelle. In fact there was nothing inside the nacelle. It was empty. The "rotor" was fake too. It was simply a 20-foot long plank carved to look like a blade. That faux wind turbine stood in the Tehachapi Pass for nearly 20 years as a testament to greed and the fallacy of using capital subsidies to encourage renewable energy development. Capital subsidies, because they encourage the sales of hardware and not the generation of electricity, are simply bad public policy. This observation, disappointingly, has been proven time and time again. As policy, it's just plain stupid. Most countries that have used capital subsidies learned their lessons and abandoned the approach-years ago. The German's put their lederhosen on just like everyone else. Their early programs subsidized solar directly with capital grants. But they had the sense to realize that this approach didn't move them toward their policy objectives: the creation of a massive new industry that would make a real contribution to energy supply. The Germans dropped their solar subsidy program and instead launched an aggressive system of feed-in tariffs-a system that had already succeeded for wind energy. Feed-in tariffs, especially modern systems of Advanced Renewable Tariffs like those in Germany and Switzerland are much better at rapidly developing renewable energy than direct subsidies or tax credits. The Swiss program even includes a specific tariff for small wind turbines of about $0.20/kWh. Several states have proposed similar policies, but all have been stymied in part by the solar and small wind turbine industries reluctance to be paid only for the electricity they produce. Some have argued that the US will eventually implement a certification standard for small wind turbines, possibly by mid 2009, and this should take care of the "rating" problem. Then again, the American wind industry has promised testing and performance standards for more than two decades and has yet to deliver. The standards will require advertising to include a "power rating" at a standard 11 m/s for all small turbines and an estimate of Annual Energy Production at a standard average wind speed of 5 m/s. While this rating system is welcome-and 30-years overdue--it won't solve the problem overnight because manufacturers will still be free to advertise whatever they like. But clearly, it will be progress. Nevertheless, Congress' use of tax credits based on capacity and installed costs have distorted today's market and dramatically reversed a positive trend initiated by one manufacturer responding to calls for more responsible power ratings.